Florida's gas shortages keep getting worse as millions of motorists flee Hurricane Irma's path of destruction. Nearly 65% of all gas stations in the Miami-Fort Lauderdale market were without fuel on Saturday, according to estimates from crowdsourcing platform GasBuddy. More than half of the stations in the West Palm Beach-Fort Pierce and Fort Myers-Naples areas have run dry. In the Tampa-St. Petersburg market, 43.5% of stations are out of gas. The fuel outages come as Florida officials order mandatory evacuations for many counties in South Florida ahead of the expected arrival of Hurricane Irma on Sunday. The storm, which is expected to remain at Category 3 strength, is extremely dangerous, packing 130 mile-per-hour winds and enormous amounts rainfall. "If you've been ordered to evacuate, you need to leave now. Do not wait. Evacuate, not tonight, not in an hour, you need to go right now," Florida Governor Rick Scott said Saturday morning. Unfortunately, that task is being complicated by the fuel shortages. One-third of the gas stations in the Orlando-Daytona Beach-Melbourne region are empty. Even Tallahassee, the state capital that is around 500 miles away from Miami, is experiencing outages in nearly half of its gas stations, according to GasBuddy. "You just have such incredible demand for gas right now as people pack up and leave," said James Miller, director of communications for the Florida Petroleum Marketers and Convenience Store Association. 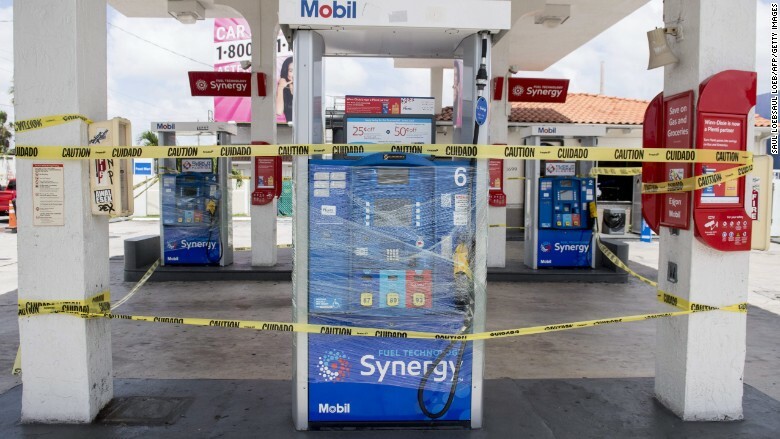 Gas stations across Miami have been forced to refuse customers as pumps have been bled dry. The gas shortages were exacerbated by "panic-buying" earlier this week from Florida residents worried about Hurricane Irma's uncertain path. The other problem: Last week, Hurricane Harvey rocked the Gulf Coast's refinery system, causing major outages that disrupted fuel deliveries to Florida and other markets. Now, there are signs that massive demand for gas caused by Hurricane Irma is spreading to Florida's neighbors to the north. In Georgia, about 20% of the gas stations in Atlanta and Savannah were without fuel, GasBuddy reported. Another 19% of the gas stations in Charleston, South Carolina were empty. There are also some sporadic outages in North Carolina. 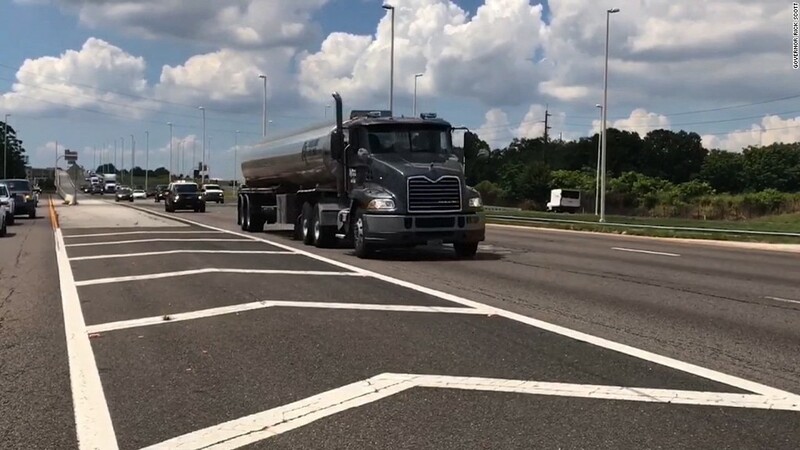 To help ease Florida's troubles, Governor Scott has also taken several steps to try to speed up gas deliveries and encourage gas stations to remain open as long as possible. He's gone so far as to offer police escorts for fuel delivery trucks shipping gas to stations along evacuation routes. "That's been a huge help and will continue to be," said Miller. Scott also offered police escorts for gas station employees to ensure they're able to get out safely before the storm hits. Florida residents who do manage to find gas should expect to pay more. Mostly due to the impact of Hurricane Harvey, the average gallon of gas in Florida sold for $2.73 on Saturday, according to AAA. That's up from $2.20 a month ago.